Western Digital produces some of the world’s best traditional high-capacity hard drives, but consumers have been moving towards faster and quieter (but smaller capacity) solid-state SSD drives from other manufacturers, presenting a unique business challenge for WD. 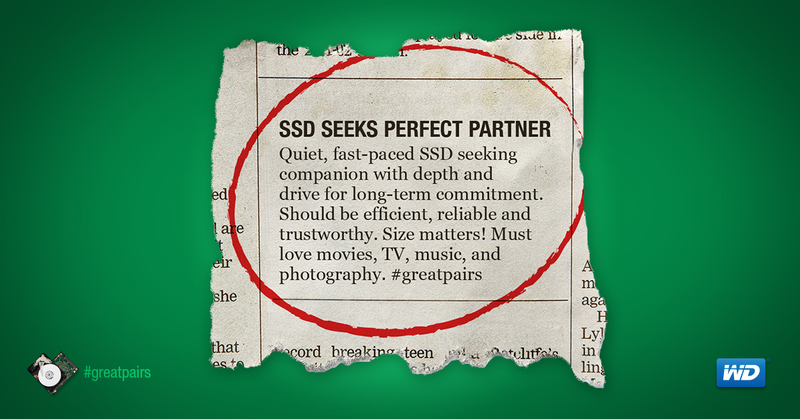 In reality, the smartest consumers choose both: a fast SSD for booting up your computer, and a high-capacity traditional hard drive for storing all of your media. The theme of this great pairing was expressed in a two-pronged approach: a series of Facebook display ads using a personal ad theme written from the perspective of the SSD, and a contest called the Dream Machine for Good. In the Dream Machine for Good contest, passionate computer builders were polled on AVS Forum in the U.S. and AV Forums in the U.K., favorite hangouts for techy DIYers. Forum members were asked to share specs for what they would consider an ideal “dream machine”, and the winning entry would be built on-camera by popular YouTube influencers: LinusTechTips (1.8M subscribers) in the U.S. and TastyPCTV (94k subscribers) in the U.K. The winning builds were donated to a charitable organization in both countries that could best take advantage of the jaw-dropping power of the systems—driven (literally) by the great pairing of WD’s Green drives and an SSD. The program was well-received by the forum community who were delighted to help design a machine for a good cause, and to date the Dream Machine for Good videos have been viewed a combined total of nearly 540,000 times.